The Millenial Generation is planning ahead! Many of those born between 1980 and 2000 are on the path to home ownership. 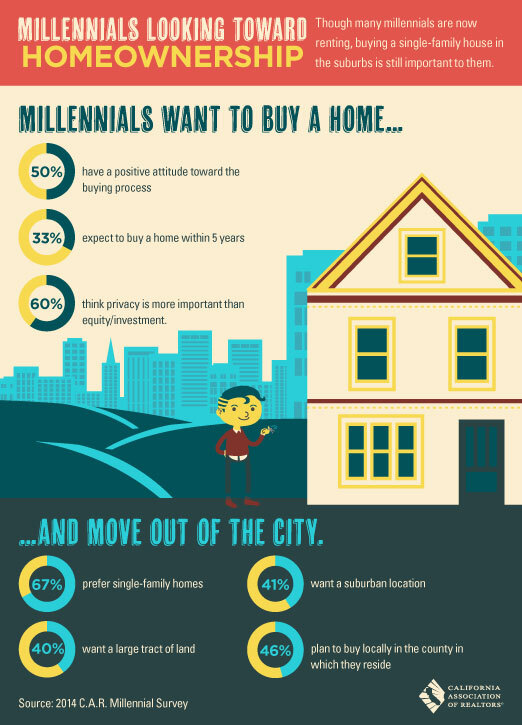 Though they may be renting now, Millennials do see the value in moving out of the cities and purchasing single-family homes in the suburbs. Use this piece to help educate your clients and social media followers about some creative ways to save water around the house. Not only will this help them lower their bills, but it will help sustain one of our most precious resources. Water is precious. Without it, life stops. Fortunately, cutting back is easy and painless and not only preserves our fresh water, but also reduces your bill! Here are 7 creative ways to save. Included after this blog post is text you can use to promote it on Facebook, Twitter, and email. All of this content is available in the Word (.doc) or plain text (.txt) file included with your download. Water is our most precious resource. As our planet becomes more crowded and the demand for clean drinking water grows, it's increasingly important that we look for creative ways to reduce needless waste. You might underestimate how small changes can really add up. Did you know simply by turning off the water while you brush your teeth, you may save up to as much as 25 gallons per month? (A great way to make this point with kids is to show them at the grocery store what 25 gallons of milk looks like... that's a lot of water!) Even shortening your shower by two minutes can add up to 150 gallons per month. 1. Keep a pitcher of water in the refrigerator instead of running the tap. Instead of waiting for cold water, every drop ends up as part of your drink. 2. Wash veggies and fruits in a pan of water, then gather the water you use and reuse it to water indoor plants. 4. Remember: Washing dark clothes in cold water saves on both water and energy, and it helps your clothes retain their vibrancy. 5. Rather than following a set watering schedule for your lawn and garden, check for soil moisture two to three inches below the surface before watering. If it's still moist, hold off on running those sprinklers. 7. Does your shower fill a 1-gallon bucket in less than 20 seconds? Replace your shower head with a water-efficient model. Reminder: Change the "YourBlogDomain.com/post-page.html" to match the location of the blog post on your website. Water: We can't live without it. Here are seven creative ways to save water (and a few surprising statistics). Drop your bill and save our most precious resource! * Your Tweet must be 140 characters or less. Twitter may shorten or change the appearance of your link, but don't worry-- it will go to the right place. If you make a mistake, just delete the tweet and post it again. Water is our most precious resource. As our planet becomes more crowded and the demand for clean drinking water grows, it’s increasingly important that we look for creative ways to reduce needless waste. You might underestimate how small changes can really add up. Did you know simply by turning off the water while you brush your teeth, you may save up to as much as 25 gallons per month? (A great way to make this point with kids is to show them at the grocery store what 25 gallons of milk looks like... that’s a lot of water!) Even shortening your shower by two minutes can add up to 150 gallons per month. 5. Rather than following a set watering schedule for your lawn and garden, check for soil moisture two to three inches below the surface before watering. If it’s still moist, hold off on running those sprinklers. Share these seven tips with others and encourage people in your neighborhood to join you in your support of water conservation.